Milan is Italy's fashion capital. If it has a predominant color, it is gray. This is because of the blocks of neoclassical stone buildings. The city is celebrated for these buildings. It is also due to its often-gray sky. It traps pollution. But Milan now wants to shift its color palette. They want it to move toward green. The city has ambitious plans. They want to plant 3 million new trees. They want to do this by 2030. This is a move that experts say could offer relief from the city's muggy weather. It is sometimes tropical. Some ad-hoc projects have already contributed to environmental improvements. One example is architect Stefano Boeri's striking Vertical Forest residential towers. These aim to improve air quality. They also aim to improve the quality of life for Milan residents. They were completed in 2014. They are near the Garibaldi train station. Boeri created a small island of greenery. It is in the heart of Milan. Brimming from the balconies of his pair of high-rises brim are shrubs. The balconies also have trees. They absorb carbon dioxide. They also absorb PM10 particles. These particles are a pollutant. They have links to respiratory ailments. They also have links to cancer. The U.N. climate summit recently took place. It was held in Poland. It urged cities and regions to help achieve the goals of the 2015 Paris agreement. The agreement was to curb global warming. The goals include limiting the increase in the planet's temperature. The goal was to limit it to 3.6 degrees Fahrenheit. That goal is for this century. The World Economic Forum's global agenda council has put extending the tree canopy among its top urban initiatives. They recognize that small-scale changes can have a major impact on urban areas. This includes helping to lower city temperatures. It includes creating more comfortable microclimates. And it includes mitigating air pollution. The program will boost the number of trees. It will go up by 30 percent. This is in the broader metropolitan area. Milan officials estimate it will absorb an additional 5 million tons of carbon dioxide. That is per year. That is four-fifths of the total produced by Milan. The program will reduce harmful PM10 small particulates. They will go down by 3,000 tons. That is over a decade. It would also reduce temperatures in the city. Temperatures would go down by 2 degrees Celsius. That's according to officials. Boeri said the current green canopy of the Lombardy region's capital is just 7 percent of the urban area. That's well below northern European cities. Germany's Frankfurt is 21.5 percent. Amsterdam is at nearly 21 percent. The Lombardy region is closer to Paris. It is at nearly 9 percent. That's according to the World Economic Forum's Green View Index. The French capital itself has been battling rising air pollution for years. Milan hopes to increase that green canopy number. They want to raise it to 17 to 20 percent. They want to do so by 2030. Damiano Di Simine is the scientific coordinator in Lombardy. He works for the environmental group Legambiente. He said potentially the biggest impact of the green Milan project will be to lower temperature. It is a city where the nighttime temperature can be 10.8 degrees Fahrenheit higher than in the surrounding area. City statistics show that Milan endures 35 tropical nights a year. Milan gets very little wind to clear the pollutants. These become blocked in by temperature inversions. This is where a layer of cool air is trapped by a layer of warmer air. That's because the city lies close to the Alps. The project to make Milan greener includes an ambitious plan. It will transform a disused freight railway network. It will become series of seven parks. It will be transformed with 25,000 new trees every year. It also includes planting greenery. It will be planted on 108 million sq. feet of flat rooftops. Trees will also be planted in 2,300 school courtyards. Other new green spaces already inaugurated include Boeri's Library of Trees. It is near the Vertical forest. It includes 450 trees. It has 90,000 plants. It is on nearly 24 acres. 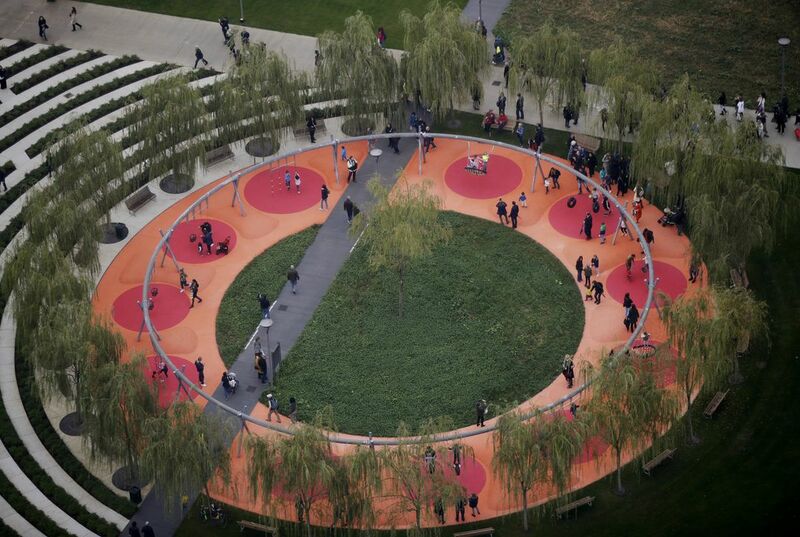 It includes a children's playground. It has a dog park. The Fondazione Feltrinelli also plans to create a park of 35,520 sq. feet. It will have plantain trees. It will have magnolia trees. It will have cherry trees. And it will have pear trees. It is near its new headquarters. The Vertical Forest has attracted more than 20 species of birds. Boeri said they did not expect this. Shade is provided by the 800 trees. The 4,500 shrubs. And the 15,000 plants. This means that residents rarely have to put on air conditioning. This may even be true during the peak of Milan's clammy summers. The Vertical Forest's total greenery has the capacity to absorb 30 metric tons of carbon dioxide every year. That's according to Boeri. "There are also other advantages that are less measurable. But I believe that the presence of green and trees has a very important effect on health and psychological state of mind. This has been proved," said Boeri. The architect is taking the award-winning concept to other cities. These cities include Paris. It includes Nanjing. It is in China. Eindhoven is also included. It is a Dutch city. 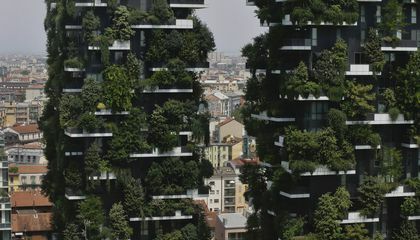 This article is about how the people in Milan are planting trees to make the air cleaner. I think that I would like to visit there. I think that because I want to see all those different plants.